How do DISC styles vary by country? Those of us who are familiar with DISC theory have often pondered the answer to this question- what does DISC look like in other countries? Do groups of people in China or Poland have the same ratios of each of the DISC styles as they do in the United States? Do most of the people who are in my occupation in other countries have a similar personality to me? PeopleKeys wanted to find out. Using data from over 260,000 people living in 50 different countries, we engaged in a cultural study to determine if DISC styles are influenced by country, culture, and occupation. We wanted to find out if different cultures preferred different personality styles in certain situations, and if people in different countries were different at home and at work. What we found was that, much like in the United States, people’s personalities were different at home from work. This was, of course, unsurprising. Part of what makes DISC so fascinating and reliable is that it takes environment into account. And it only makes sense that people would exhibit different traits in professional environments. One of the things that we were interested in determining was whether or not people in leadership positions across the globe had similar personality styles. We found that C-Suite employees had predominantly the same style personalities regardless of their country of origin. CEOs and CFOs in many different companies had D as their dominant personality style. This is similar to the results found in the U.S.
Every personality style has the capacity for excellent leadership. And every personality style lends itself to a different, but equally beneficial, leadership style. Research has shown that though other styles may be just as effective leaders, more primary Ds push to climb the corporate ladder, leading to a higher representation at the top. The cultural study also revealed that people in many countries adapt to their environment, as expected. We initially looked at how all respondents surveyed rated themselves in the home environment, or with family. Typically, only about 3% of the population exhibit the D as their highest style at home, with 66% showing the Steady, Secure, Safety oriented behavior. The next group we looked at were professors and students within a college or university environment in 50 different countries. What we found was that in China, for example, while slightly higher than a home environment, only 5% of respondents surveyed exhibited the high D style within the university environment. The S, C, and I styles represented the largest percentage of this sample. This may be due to the idea that these styles are more suited to a conducive and egalitarian learning environment. We found that there were slight increases in the Dominant, or “D”, style that can be seen when the environments change from being more relational and instructional to more “traditional” workplace environments. (Traditional in this sense is used to indicate an environment in which there is a workplace hierarchy with management on top and subordinates.) This slight rise in percentage of D style personalities continues to increase as the environment progresses from the home/family environment toward more traditional and professional workplace environments. Volunteer positions, coaches and trainers, and business people in general each showed increasing percentages of D style personalities. 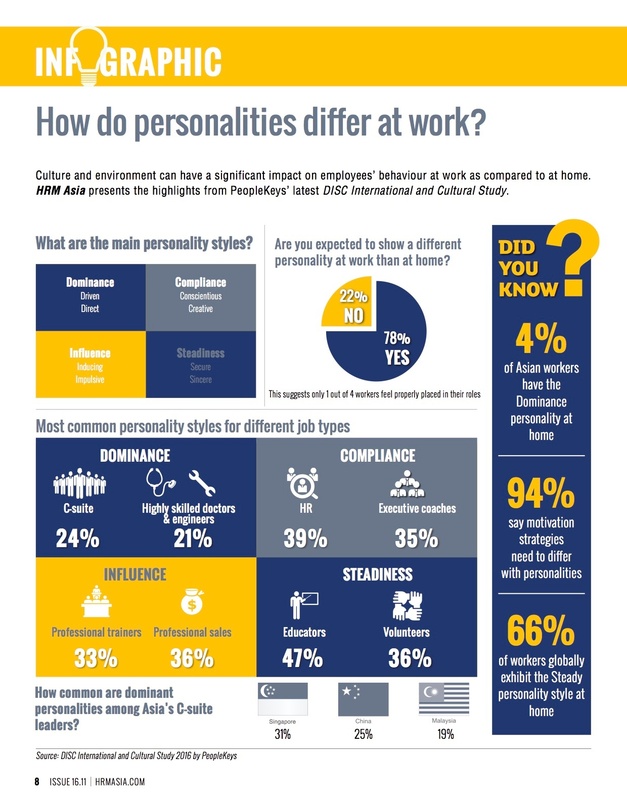 Do you know what your personality style is at work vs at home?